Tate simi, hiude simi, sword beans. They are also recognized by dolichos bean, hyacinth bean, seim bean (India), Egyptian bean, bonavist bean/pea, dolico lablab, fagiolo indiano, etc. Alternate Scientific Names – Dolichos benghalensis Jacq., Dolichos lablab L., Dolichos purpureus L., Lablab niger Medikus, Lablab purpurea (L.) Sweet, Lablab vulgaris (L.) Savi, Vigna aristata Piper. One the seasonal beans of Nepal which is planted on spring season like mid April [baisakh first week]. They start to see flower anytime after mid-summer. The pods will form shortly after the flowers start fading and pods also starts to change its color according to different bean types. Mature beans are dried and can be stored for next season crop. This crop is grown in Terai [Nepali flat land area] to the High Hills in frost free season. 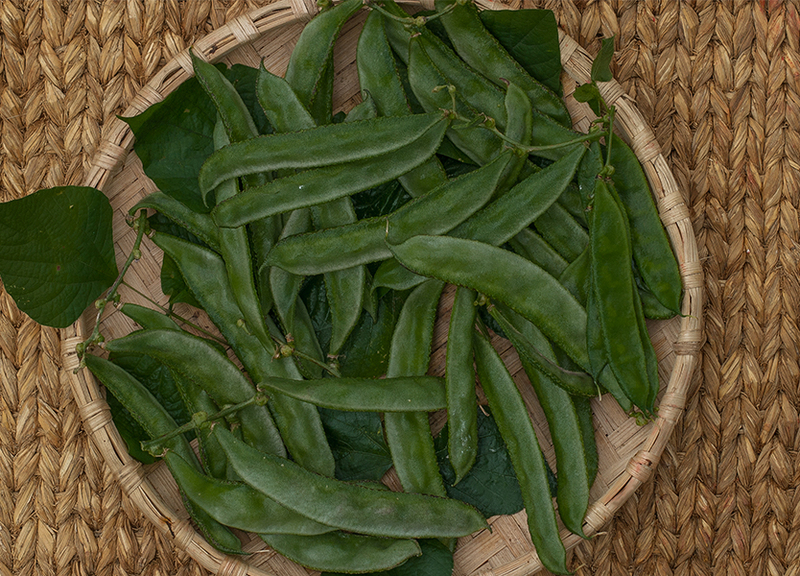 The green pods of various size and shapes are consumed as vegetables. These beans are freshly picked and cooked. To clean the pod, simply pull off the top and “unzip” the seam of the bean pod. Open the pod and remove the beans. Fresh pods and beans are often cooked together with potatoes, which is a famous combination of dish named Alu Simi. Alu means potatoes and simi means beans. - Bakkula, fava beans with pod. - pyaj, onion, binomial name Allium cepa.